Home > Blog > Who is the Black Madonna? Who is the Black Madonna? Where did the Black Madonna come from? What hope does she offer for the treatment of PTSD and other traumas? Part 1: Where did the Black Madonna come from? The question of why the artists intentionally used dark wood, stone, and paint pigments to make these Madonnas look black is best answered by the excellent People of Color in European Art History blog. However, in the opera The Canticle of the Black Madonna, she is not a statue or painting, but rather a psychological and spiritual force, a Jungian archetype, a representation of divine love. Part 2: What does she represent? In The Canticle of the Black Madonna, the Black Madonna appears as an on-stage character, the living presence of the transformative power of compassion and acceptance. Those in the audience who are inclined toward psychology might relate to her as a Jungian archetype, an experience of the Goddess as the Universal Mother which is activated within each person in times of great need and who, through the workings of the deep unconscious, reveals a way to transform the shadow and open a path of healing and reconciliation. Those who are more steeped in spirituality might experience her as a loving energy, the loving wisdom of the Divine who manifests when all hope is lost. And those who are comfortable with the European tradition of the Miraculous Madonna will see her as God’s grace which is bestowed upon us when we confront challenges that seem too large to bear. 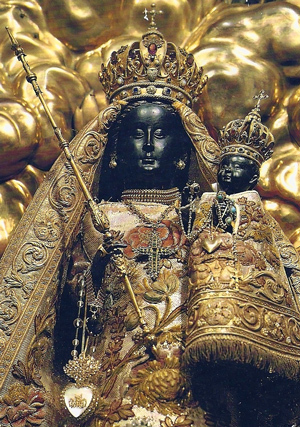 We, the creators of The Canticle of the Black Madonna, see her as the embodiment of divine mother love. How can she be a physical embodiment, given that none of the on-stage characters ever see her when they’re awake? That is the secret to the entire opera: she becomes one with the characters, which is to say that she embodies in us. When the Black Madonna is embodied in the character of Mara, the soldier’s wife, we too feel the Black Madonna stirring in the depth of our own psyche. When the Black Madonna gives Mara the strength and wisdom to open her heart to her veteran husband, Adam, and to become an agent of healing for him, we—as the audience—also experience a sense of relief from our own conflicted feelings of pain, guilt, and trauma. This is the mystery of The Canticle of the Black Madonna. Beyond merely telling a story through drama and music, it creates a rare opportunity for the audience to join in the characters’ journey of transformation. Part 3. What hope does The Black Madonna offer for the treatment of PTSD and other traumas? While psychology has much to offer trauma survivors, it is the living experience of this love that enables them to feel whole again, to find forgiveness, and reconnect with their own true self. And while many of us are spared the life-shattering traumas experienced by survivors of war, we all share a deep and often repressed longing for this Dark Mother to inhabit us in the midst of our pain and guilt in order to restore our sense of goodness and our sense of belonging to the larger, all-loving family of humanity. The logical mind cannot heal the trauma of the moral injury and the shattered soul that those who experience the brutality of war suffer. It is only through the archetypal realm—expressed through the arts and spirituality—that those wounds can be soothed and life can find a new meaning. The Black Madonna brings the luminous power of love into the darkest places of our existence. The Black Madonna calls us to Grieve. The Black Madonna is the sorrowful mother, the mother who weeps tears for the suffering in the universe, the suffering in the world, the brokenness of our very vulnerable hearts. In the Christian tradition she holds the dying Christ in her lap but this Christ represents all beings—it is the cosmic Christ and not just the historical Jesus that she is embracing, for all beings suffer and the Black Madonna, the Great Mother, knows this and empathizes with us in our pain. She embraces us like a tender mother, for compassion is her special gift to the world. She invites us to enter into our grief and name it and be there to learn what suffering has to teach us. Creativity cannot happen, birthing cannot happen, unless the grieving heart is paid attention to. Only by passing through grief can creativity burst forth anew. Grieving is an emptying, it is making the womb open again for new birth to happen. A culture that would substitute addictions for grieving is a culture that has lost its soul and its womb. In the year ahead, over 30,000 U.S. servicemen and women are scheduled to return home from war. Those who have experienced severe trauma—regardless of which direction the gun was pointed—are the ones most in need of that “new birth” of which Rev. Fox speaks. After the events of September 11, many of us moved from shock, to rage, to war, without first giving enough time for grief. We, as a society and a culture, have substituted all manner of addictions instead of grieving because we have lost our connection with the all-loving, all-comforting, all-healing presence of the Universal Mother inside each of us. And that connection is powerfully re-established through the experience of The Canticle of the Black Madonna. In the Litany of the Black Madonna sung at the beginning of the opera, we poetically represents her as the Divine, not in the spirit of heaven but in the thickness and darkness of matter. The Black Madonna then becomes the Mother of Matter, the Divine in the depths of the physical universe. 6/26/14 Films for Action: How Can an Opera Help Vets with Combat PTSD? Copyright © 2019 by Anima Mundi Productions. All rights reserved.